Born in Brazil, but raised in Lebanon and issue of the French university system, Carlos Ghosn has spent his entire working life in the automotive industry and is something of a legend on the circuit. Having completed engineering degrees at two of the most prestigious higher education institutions in Europe, the École Poltechnique and École des Mines de Paris, Ghosn joined tyre manufacturer Michelin, where he remained for 18 years, rising through the ranks. Then, in 1996, he joined Renault as the Executive Vice President and became CEO in 2005. While being president of one of Europe’s top car manufacturers is nothing to be sniffed at, Ghosn is also the top man at Nissan and the first person in the automotive business to be a joint CEO. It is this side of his work that has turned him into a minor celebrity, because he is the man who saved the company from near death. Ghosn became Chief Operating Officer of Nissan in 1999 through the Renault-Nissan Alliance. Through this arrangement, the first between a Japanese and a French car maker, each company has a stake in the other, with Renault owning 44.4 percent of shares in Nissan and Nissan having a 15 percent stake in Renault. When he arrived, the Nissan was on the verge of bankruptcy: Of the 48 models manufactured by the company, only three were generating a profit and its debts were $20bn and rising. Many industry analysts saw Renault’s decision to ally itself with a failing company and to give it a $5.4bn cash injection as pure folly, but Ghosn was more than up for the challenge: Not only did he promise to resign at the end of his first term if the organisation had not returned to profit, but also claimed that it would be debt free by 2005. To achieve this, however, he would go against Japanese culture and, initially at least, make himself very unpopular amongst traditionalists in the country. Ghosn did not earn the French nickname ‘Le Cost Cutter’ for nothing and the Nissan Revival Plan was both radical and severe. Five of the firm’s domestic plants were closed and 21,000 people made redundant worldwide. Non-core assets, such as the business’ aerospace division, were sold off and waste was identified and eliminated. Despite this, he ensured that this restructuring was very much a Nissan restructuring – he did not bring in a team of French managers, but instead used the existing executive workforce to rebuild the company. He was true to his word, however, and by March the following year Nissan had returned to profit and it is now a top-ten global car producer by size – no mean feat for a business that relies on the Japanese market for a third of its sales. 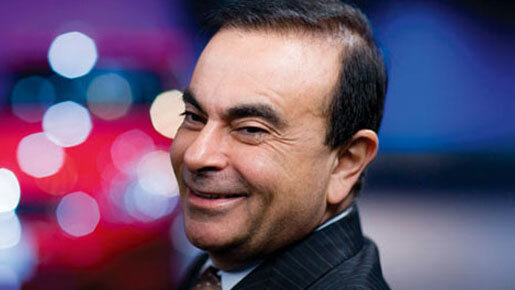 Due to his massive success with Nissan, Ghosn is a celebrity both in and outside of the industry. In 2001, the same year that he became the company’s first non-Japanese CEO, he was turned into a comic book hero when his life was serialised in Big Comic Superior – a claim that can be made by few other business leaders. Having turned around Nissan and become CEO of Renault in 2005, his focus now is maintaining competitiveness in the short to medium term while ensuring its future and at the centre of this plan is future fuels. This is not just empty words or concept cars either, but an important and strategic part of his business plan for both companies. The project will launch with the Nissan Leaf, which will be available for sale in Europe from the Beginning of 2011. The car is fully electric and is predicted by Ghosn to be the world’s first electric vehicle (EV) to be successful on a mass scale. Indeed he announced during a speech to the Detroit Economic club in May that the full allocation for the US has already sold out before its release date in December. The decision to use lithium-ion batteries and create a niche for the company in the fully electric vehicle market is not just a strategic decision, it is also a cost based one. This may have seemed a counter intuitive statement for those in the industry, as this type of battery is an extremely expensive piece of technology, a fact that Ghosn fully accepts himself. However, he is also adamant that, because the EV has fewer parts than a hybrid engine, overall it is cheaper to produce even before you factor in economies of scale. While some may retain their scepticism, one of the things that has made Ghosn so famous is his talent for managing costs. He is also pragmatic, “Electric cars are not going to take the market by storm,” he told the BBC World Service, “but it’s going to be a gradual improvement.” Nevertheless, he has forecast an eventual production rate of 500,000 per annum. Despite his economic acumen, the recession has touched Renault and Nissan as much as any other car company. To manage the downturn, he has focussed not so much on cutting production, although that has been necessary to some extent in order to keep the company’s inventory in check, but on managing market share. Thus he has been able to ensure that both Nissan and Renault remain profitable during this difficult time. As a Comic book hero, environmental champion and saviour of Nissan, Carlos Ghosn is a CEO who is perhaps beyond compare. An economic realist, but a true believer in innovation, he uses both these attributes to manage his charges effectively and profitably. With the launch or the Nissan Leaf commencing in Japan and the US in December, his faith in electric vehicles will be put to the test. If the plan does come through as expected then he can add another trophy to his list of achievements: The man who made the electric car a mass market item. As he is a man who has rarely been wrong, do not be surprised if, upon reviewing his CV in 2020, it’s another accolade that is on there.